A pro-European ex-business minister has called on Theresa May to "get a spine" and remove 35 "hard ideological Brexiteers" from the Tories. Anna Soubry told BBC Newsnight she is willing to leave if the likes of Boris Johnson and Jacob Rees-Mogg take over. The MP, who was in David Cameron's cabinet between 2015 and 2016, said the PM's "red lines" to leave the EU single market and customs union are wrong. Former Tory Chancellor Lord Lamont said Ms Soubry was being "quite ridiculous". Ms Soubry was speaking after the EU's chief negotiator Michel Barnier warned in Downing Street that the UK's Brexit plans would create "unavoidable" barriers to trade in goods and services. She told Newsnight that all her suggestions, to remain in the single market and customs union or to negotiate membership of the European Free Trade Association, have been dismissed by No 10 - and blames the influence of Tory Brexiteers. What are the UK's Brexit trade options? "My front bench... is in hock to 35 hard ideological Brexiteers who are not Tories," the Broxtowe MP said. "They are not the Tory party I joined 40 years ago and it is about time Theresa stood up to them and slung 'em out. They have taken down Major, they took down Cameron, two great leaders neither of whom stood up to them." The former minister added that she is prepared to leave her party unless Theresa May challenges her opponents. "If it comes to it I am not going to stay in a party which has been taken over by the likes of Jacob Rees-Mogg and Boris Johnson. They are not proper Conservatives." She added: "Unless Theresa stands up and sees off these people she is in real danger of losing huge swathes of not just the parliamentary party but the Conservative party. "That is the risk that she runs. She thinks she can pander to 35 forgetting there is a much larger group who are getting sick and tired of this." Ms Soubry was speaking as the Brexit cabinet sub committee prepares to meet on Wednesday and Thursday this week to draw up a UK negotiating position on its future relationship with the EU. On Monday Downing Street reiterated its decision to withdraw from the EU customs union and not to join a watered down customs union with the EU. Ministers instead want to negotiate a separate customs arrangement or customs partnership. Downing Street says this is the only way to allow the UK to sign future trade deals around the world while seeking to maintain frictionless trade with the EU. 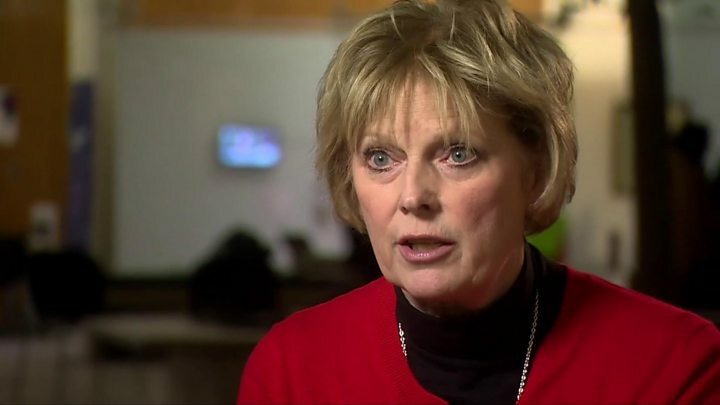 Ms Soubry told Newsnight: "Frankly people have got to grow some, get a spine, stiffen up, stand up to these people - most of them are ghastly bullies but also cowards at the same time - and speak up for their constituents and what is right for our country. "And if that means leaving the party, form some new alliance, God knows I don't know. But we just simply cannot go on like this any longer." Asked about Ms Soubry's intervention, the pro-Brexit Lord Lamont said: "I think that is quite ridiculous frankly. "I don't want to be rude about Anna Soubry but she does tend sometimes to go over the top. I think she is doing that here."